Helen D. Knight, 98, of Lancaster, entered eternal life with Christ on Tuesday, March 27, 2018 at Lancaster General Hospital. She was born on January 1, 1920 in Orange, NJ to Daniel J. Denney and Anna Matilda Coleman Denney. She resided in West Orange and Middletown Township, NJ prior to relocating to Lancaster in 2000. Helen retired after many years working for NJ Bell Telephone Co. She enjoyed sewing, crocheting, traveling the United States, walking, vacationing with her family and friends at her second home in Upton, Maine and, most of all, spending time with her children and grandchildren. Helen was a member of St. Leo the Great Parish, Rohrerstown and was pre-deceased by her loving husband of 49 years, Joseph Knight on March 24, 1995. She is survived by her three daughters: Kathleen K. Cooper, Felton, DE, Denise A. Knight, Raleigh, NC and Colleen M. Knight Anastasio, (Gerald) of Lancaster. 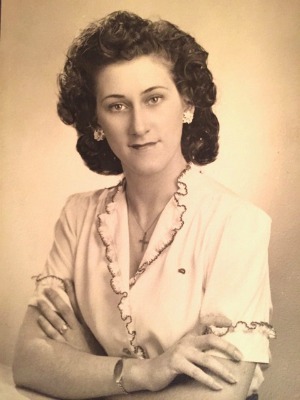 She was the loving grandmother to eight grandchildren; great-grandmother to twelve great-grandchildren and great-great-grandmother to two great- great-grandchildren. Relatives and friends are respectfully invited to attend her Funeral Mass at St. Leo the Great Church, 2427 Marietta Ave, Rohrerstown, PA at 11 am on Wednesday April 4, 2018 with the Rev. Peter Hahn officiating. Friends may greet the family from 10 am until the time of the service. Interment will be on Thursday, April 5, 2018 at 12 noon in St. John’s Cemetery, Orange, NJ. In lieu of flowers, contributions may be made in her memory to St. Anne’s Retirement Community, 3952 Columbia Avenue, Columbia, PA.
Our deepest sympathy during this difficult time. She was a lovely lady and will be missed. Our thoughts and prayers are with the family. My sincere sympathy to you Colleen and your entire family. My thoughts and prayers are with you. May you have comfort in the endless memories made. God bless. Colleen , you will never forget the love that you and your dear mother have shared. Keep her memories close to your heart. You and your family will be in our prayers. So very sad for all of you. Hoping your precious memories and faith keep you strong. Please know my warm thoughts are with you. I am sorry to hear of you Mom’s passing, I believe she is with your Dad and in a better place. You all were blessed to have had her for so many years, may you find solace in her peace. So sorry Colleen. Thinking and praying for you during this difficult time. Losing a mother is lonely. Colleen , I am so sorry to hear of your mother’s passing. My thoughts and prayers for you and your family. Although devastating and a great loss to you, she is at peace and reunited with your father. God bless her. Dear Anastasio family, I’m very sadddned to hear of Helen’s passing. She and Jeannette were so close and spent so much time together when Helen came to Upton. The road between their cabins was never long. I hope they are both enjoying each other’s company on the porch swing in Heaven. Those days will be fondly treasured for the rest of my days. I am so sorry for your family’s loss of Colleen. May you find comfort in the many precious memories you shared together as well as God’s promise to restore our dear loved ones to perfect life on a paradise earth. As you contemplate that promise, draw close to God in prayer and he will draw close to you and prove the needed strength to carry you through the difficult days ahead. All the best wishes for your family at this time, take care of each other.